First post on this Forum. It looks like I will be back a lot in the future. I visit approx. 10 gun forums twice daily. Been members of several for years. So very old hand with guns. But I have a dilemma that I could use help on. I am in the market for a new Target / Plinking Pistol in 22lr. I am wanting a New S&W Model 41, but every time they come in I am not able to get in touch with them quick enough to acquire one before they are sold out again. Usually due to being at work when I receive the email that they are in stock again. Anyway to my point. They due have the Hammerli X-Esse IPSC in stock and it really is looking like a very well made pistol. But everything I read about it say's it is made of metal. But does not state what kind of metal it is made of. Is it Steel ? Anyone that can answer that please help me out. It sounds like it is not ammo sensitive like the Model 41 S&W. I am also not sure about the rear sight being mounted on the slide for accuracy. All though all the video's and everything I read states that they are very accurate. I look at the grip and the LOP looks like it would fit my smaller hands, also looks like you could buy wooden grips and sand them to your liking if so desired. I am really just about to pull the trigger on the purchase but really would like to have the Material that it is made of question answered first. I have 2 Trailside's that I bought used. I have put about 5,000 rounds through each gun (CCI Standard Velocity) without any problems. One thing to think about with the IPSC Essex to consider is that it would not be legal for EIC matches as it has a compensator. The other thing about buying a new Hammerli is that they have discontinued (I think they did this on 2017 and newer models) milling the 11mm dovetail on the barrel. This makes the cost of your scope mount to be about $150 if you decide to put optics on it. the Trailside did have an issue with the slide catch notch wearing quickly if you released the slide with the stop. Sling shot the slide and you normally don't have an issue. No idea if the Xesse has this issue at all, as it is being made by Walther and not Sig these days. Lots of good running Trailsides and Xesse out there. we have several in our bullseye group. Both my wife and I shoot one for BE. I believe only the ISPC model of the Xesse has been discontinued.. both the Sport and Long versions show on the current product list of Walther. As far as I know the IPSC model is still in production, we just bought two of them and the manufacturer date on one of them is 2018. They still have the 11mm dovetail cut into them also. Allen Barnett wrote: I have 2 Trailside's that I bought used. I have put about 5,000 rounds through each gun (CCI Standard Velocity) without any problems. One thing to think about with the IPSC Essex to consider is that it would not be legal for EIC matches as it has a compensator. The other thing about buying a new Hammerli is that they have discontinued (I think they did this on 2017 and newer models) milling the 11mm dovetail on the barrel. This makes the cost of your scope mount to be about $150 if you decide to put optics on it. There is no comp on my IPSC model Xesse. They did stop milling the 11mm dovetail in the other versions but the IPSC still has it. I do know about the slide problem, by what I understand is that you just sling shot the slide and no problem will happen. The IPSC still has the dovetail and you can also mount a scope rail on it. I will not use it for competition, it will be for steel plates at 25 yards. The plates range from 2" up to a foot on my home range. I use to have an older model S&W model 41. If I did not put a drop of oil on the first round it would have stove pipes constantly. It was around a 1970's something model. I even bought a second barrel to try and correct it. Still had stove pipes no matter what I did. Sold it, figured one day I would buy one with the Lifetime service warranty. But this X-Esse may be the way to go. No feed or extraction problems and just as accurate as the 41. It will never see optics if I do get one, which I am really looking to doo. It is an all steel pistol I guess from what I read. But anyone know what kind? I can't help you with the type of steel used but here is the email address that I sent all my questions to when I first looked at buying mine. He should be able to help you out. 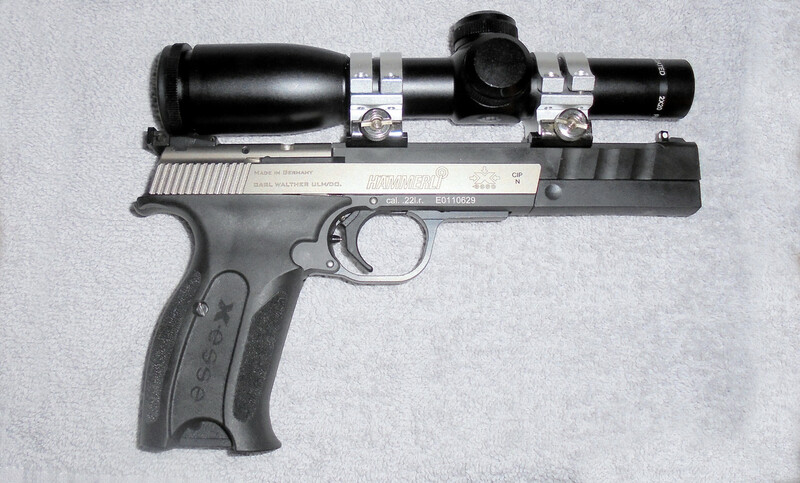 The Xesse is very light weight and a great shooting pistol. Ordered my Hammerli X-Esse IPSC today. Wish me Luck, I am very nervous and excited at the same time. Never held one of these and as stated above I was really wanting a S&W 41 but I also remember how many falures I had with my S&W 41 that I am going to give this pistol a go and see how she does. I hope to get her around Friday, or at least I am crossing my fingers for that day. We have two Hammerli X-esse. I bought one for my wife for bullseye about 2 years ago. Then she shot my Feinwerkbau AW93 and I have not shot the AW93 since, she will not let me near it. I started shooting the X-esse for 1/2 year during weekly indoor bullseye and did OK with it. Then bought a 208 S that I never shot as well as the X-esse. My problem not the pistols. For the last 1/2 season I have been shooting a Benelli MP95 for rimfire and my scores are doing quite well. We purchased a second X-esse recently for steel. One for her and one for me. Today at a range we were shooting the X-esse both as practice for steel and doing some bullseye type shooting with it. I was surprised at the accuracy of this pistol with a red dot, Larry's mount AND Larry's trigger. We have a few thousand rounds through both pistols with rarely a problem. They are a terrific entry into Bullseye competition, IMHO. I would not hesitate to purchase another should I ever need a third. Unlikely. Thanks David, looking forward to trying it out. [ltr]“Sport Fun” was the motto behind the development of the x-esse pistol. Noted for its dynamic design, attractive pricing and compact size, the x-esse is also a pro when it comes to precision. Having read that, i feel soooo much better about myself owning one now. Yes that is quite the description. I feel sophisticated. That is if I get mine. Kind of confused . I ordered mine from Grab A Gun.com, got the shipping notification when I got home. Looked and they only shipped the Ruger SP101, and not the Hammerli X-Esse that I also ordered. They were closed when I looked at it. So I guess I will call them in the morning and find out why they only shipped the one gun. I can only imagine that they did not want to send both guns in the same package in case of theft. So I hope I will get another shipping email in the morning. I will call and find out though, I know they had plenty in stock. jglenn21 wrote: Having read that, i feel soooo much better about myself owning one now. Time to get the X-esse tattoo like the kids on the cover of the User Manual have. Maybe the manual and description was written by an English For Runaways fan. Certainly translated from German, then edited by a person who speaks English as a second language and has never have visited the USA. Took her to the range yesterday (3-23-2019) Beautiful Spring Day. I shot 200 rounds of just straight Federal Hollow Point HV ammo (Bulk Box of 550) she did awesome. I did have a couple of problems with the pistol though. Twice it did not feed a round and twice I had almost no firing pin strike. The ammo feed is I am pretty sure due to the plastic ammo magazines and how I load them. Both times the second round was laying to flat to be picked up. I believe I have that figured out now and the light to no firing pin strike was I believe that the pistol was starting to get dirty after 200 rounds, at least I am hoping that is what it was. Did not happen until about the last 50 rounds when she was getting dirty. The only other problem that I had ( I believe that I already have it fixed) was the scope rings moving down the rail getting closer to the rear sight while I fired. Did not bother the accuracy but can't have that happening while enjoying the shooting of her. What I did do to take care of it was on the UTG Ring to scope rail adaptors have a pre-drilled hole for an Allen screw. I put an Allen screw and then seated it down on top of the scope rail/barrel in the center of the Allen screw that are factory mounted in the top of the barrel for a after market Weaver type rail. After remounting the scope back onto the pistol I can not use the finger screw to remove and mount the scope for a proper cleaning. While shooting it yesterday, I really enjoyed my self. I have a total of 13 plates and a bear and a Coyote ranging from 2" all the way up to 12" at 25 yards. I could hit that 2" plate from the 25 yards 8 out of 10 times free handed. This was using HV Bulk Box ammo. I could never do that with my Mark IV Hunter I had even with the full up graded trigger. Never. Love the way this pistol fits my smaller hands and the two stage trigger. Very happy with it. Took her out again today (3-24-2019) fired 200 rounds again. Had to sight the scope back in because of the changes I did and changed scope rings also. Out of the 200 rounds I had one failure to feed. I hate to hear the firing pin hit on a empty chamber. I had one no firing pin indent. But the scope worked well with the Allen screw in the UTG adaptor and different rings. It did not budge, this thing is very accurate even with the HV ammo. I absolutely Love shooting it. I think I will try and locate a scope rail for it though. I am having trouble finding any right now. Seems everyone is out of them and I don't even see any that would work with the screw on top of the barrel. Had a blast again today. Took her out again today. I wanted to check everything out because my shooting HV ammo constantly out of her I wanted to make sure that the trigger guard ( the part of it where the slide hits) was against the frame and would not break or crack from the slide impact. So I did the filling on the trigger guard, really quite a bit to get the square against the frame. Worked out really well, and like the way the trigger guard works a lot better now. Stays centered and closes all the way on it own smoothly. Very happy how it turned out. Now the only problem with the pistol, is out of the 100 rounds I shot today I had three or four failure to fire. When you look for the reason why, the extractor is not on the lip of the brass. Let the slide close on its own and the round fires no problem and extracts. There is not even a scratch from the firing pin when this happens. I took a spent brass and removed the slide, the extractor claw is barley even going over the lip of the brass. It will hold the shell but barely . I may have to remove the extractor and do some adjusting/filing to get it to set up against the wall of the cartridge and over the lip of it. I think that is the problem with the firing pin not denting the cartridge. I will give it a little more time to break in first and see what happens, maybe just the extreamly cheap ammo I am using right now.